Elena Michaels is determined to go it alone. She doesn't need the pack. She doesn't need Clay, the werewolf who misled her, made her believe he loved her, and then turned her into one of them without her permission, without even telling her what he was. 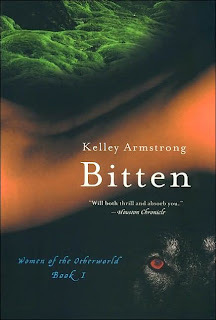 To make matters worse, it turns out she's the only female werewolf in the world. That's right. Elena's the Only One and so not interested in dealing with the inevitable "attention" this brings her way. So she leaves the pack and moves to Toronto where she gets a job as a journalist and finds a nice, normal boyfriend to cuddle with. Problem is, she can't outrun her past and she can't escape the call of the wolf. Her troubles intensify when the pack needs her help and Jeremy, the Alpha, calls her home to help them solve a string of grisly murders. They suspect some mutts (rogue wolves) of causing the mayhem and Elena's specialty just happens to be tracking mutts. Unable to refuse Jeremy's summons, Elena reluctantly returns to the compound in upstate New York. Gritting her teeth in anticipation of the welcome she'll receive. Turns out Clay's been waiting for her this whole time, insisting he's still in love with her and always has been. Elena's pretty sure she's still in love with him, too. But none of this stops them from bickering like teenagers and snarling at each other every chance they get. The scenes where members of the pack interact as a motley, roughhousing family are extremely well done. As are Elena's painful transformations from human to wolf form. The undeniable sense of freedom and belonging she feels back with the pack is vivid and tangible and I found myself wrapped up in finding out the fate of these vulnerable, larger-than-life characters. Elena's external and internal conflicts were well-plotted and compelling and the book builds strongly toward an intense showdown between the pack and the mutts. Only in the last few pages is anything resolved and, unfortunately, I felt the internal conflict was wrapped up entirely too quickly. Elena and Clay's relationship was wonderfully messy and complicated, with layer upon layer of distrust and longing. The book itself was almost 400 pages and trying to clean the mess up in just the last six pages left me dissatisfied and upset. I liked the whole tangled web and felt it deserved a more careful treatment in the end. I am currently still wrestling over whether or not to pick up the sequel, Stolen. I liked this book, but I agree with you about cleaning up the relationship too quickly at the end. I am going to read the 2nd book...I just want to see if she does a better job. Thanks for the recommendation! I'm glad you enjoyed it (for the most part). I still haven't been able to bring myself to read book 2, so be sure to let me know what you think.